Bean growth begins when a seed is exposed to water and warm temperatures, conditions that nudge it out of dormancy. The seed develops into a plant that eventually grows more seeds to start the process again. Easy to grow, bean plants often provide large harvests if properly cared for and protected. They are low in fat and high in fiber. A bean undergoes several stages in its life, from seed to plant. A bean seed consists of two halves, called cotyledons, that store nutrients. Endosperm cells, which contain moisture and organics like starch, proteins and oils, feed the embryo, or tiny plant, contained between the halves as germination commences. A thick coating protects the seed until it begins to grow. 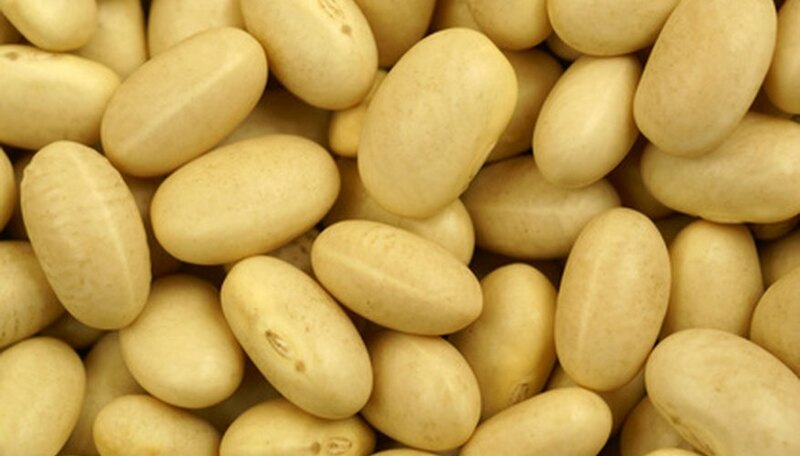 Bean seeds, generally oval in shape, come in a variety of sizes and colors. Soil temperature must be a minimum of 60 degrees F before bean seeds can germinate, according to the Alabama Cooperative Extension System. For germination to begin, water must enter a small hole, called a micropyle, in the seed coat at the thick hallow, causing the wrinkled seed to swell and split apart. The seed’s structure continues to change as the embryo grows and other seed parts emerge. A radicle, or undeveloped root, pokes out of the seed and begins burrowing into the soil, while a shoot, or plumule, starts pushing upward. The root continues to develop and form secondary roots, which serve as an anchor and draw more water and nutrients from the soil. The shoot pushes through the surface, carrying the cotyledons with it. As the first leaves unfurl, the seed coat is shed. An intricate, but shallow root system grows while the plant above ground reaches upward, according to Plantcare.com. A thicker stem develops, carrying nutrients to the increasing number of leaves that unfurl from it. Through photosynthesis, the leaves turn sunlight into sugar and other organic material necessary for the plant to keep growing. Some bean plants grow into vines that can reach several feet high if given a suitable climbing structure, like a pole; “bush” plants remain low to the ground and stand without support. Small, light-colored flowers bloom on older plants near the leaves. Bees distribute pollen to and from the flowers, which is necessary for bean pods to grow. The pods contain edible seeds that can perpetuate the growing process.